Celebrate with crackersNo Christmas table would be complete without the crackers. 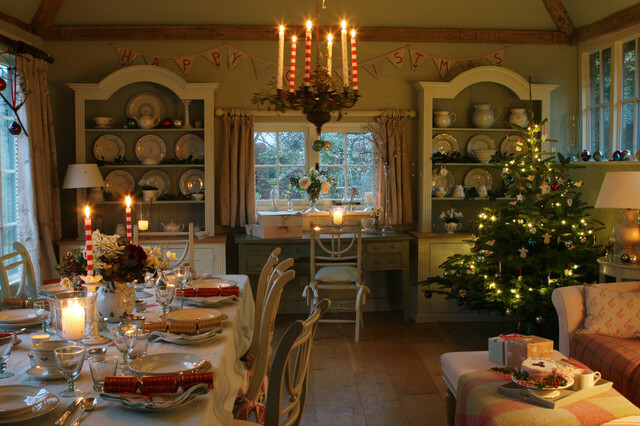 If you’re feeling particularly inspired, you can even buy kits that allow you to make your own, and then can insert home-made gifts and personalised jokes for friends and family.Check out 10 festive traditions for families to start at home and browse more traditional dining room photos. Pack with fairy lightsThere are few things more festive than the warm glow of fairy lights around a tree that looks as if it’s been decorated with love. Go all white for a twinkly look or choose a colourful string for retro sparkle. Don’t forget to make time in the dark December evenings to sit in the low light and enjoy the feeling of anticipation. Furniture placement - split bookcases with desk.